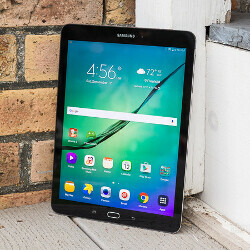 Towards the end of last month, Zauba listings revealed a couple of new Samsung tablets, leading to suggestions that the Galaxy Tab S3 could soon be in the offing. Now, the two supposed additions to the Tab S series have popped up on Geekbench and GFXBench, pointing to a possible Mobile World Congress unveiling alongside the Galaxy S7 and S7 edge smartphones. The Galaxy Tab S2 is available with 8.0 and 9.7-inch displays -- a trend that seems likely to continue through the next generation if the recent benchmark findings are to be believed. 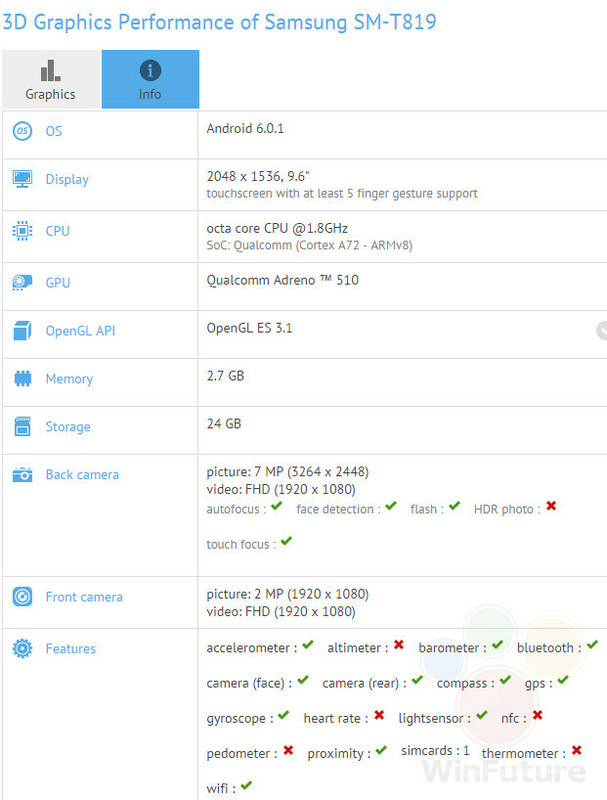 The larger, 9.7-inch Samsung slate (SM-T819) has been outed via GFXBench, and looks set to include a 1536 x 2048 display, an octa-core Qualcomm Snapdragon 652 SoC clocked at 1.8 GHz and Adreno 510 graphics. Elsewhere, there's likely to be 3 GB of RAM, an 8-megapixel rear-facing shooter and a 2-megapixel effort for selfies. The GXFBench database also shows the device running on Android 6.0.1 Marshmallow, which one would expect of any new, higher-end device being released by Sammy. The 8-inch model (SM-T719) looks set to be furnished with the same processor and graphics, and should also pack 3 gigs of RAM. As with the larger variant, it's not shaping up to be too dissimilar to its predecessor, suggesting that Samsung is planning a low-key refresh. Therefore, while a MWC unveiling seems probable, the so-called 'S3' duo may instead carry the 'Galaxy Tab S2 (2016)' moniker, or something else to that effect. In our reviews the Galaxy Tab S2 8-inch and Galaxy Tab S2 9.7-inch gave decent accounts of themselves, both attaining a solid 8/10 rating. Given this, it would seem that Samsung isn't going overboard with improvements. Here's hoping that the niggling issues we discovered, such as the poor speaker and weak brightness output aren't overlooked with the 2016 models. 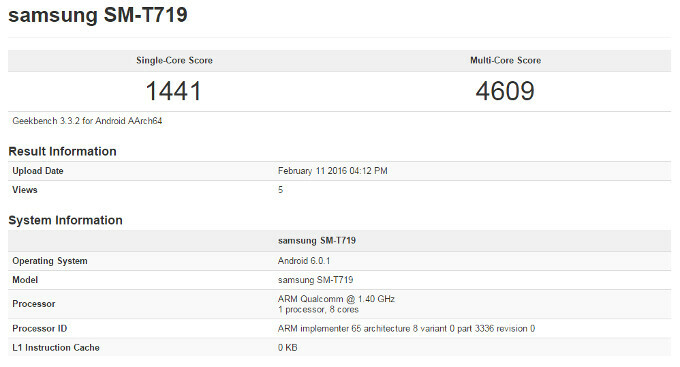 Those Geekbench benchmark scores place it slightly ahead of the Exynos 7420 (1341 single core and 4507 multi core). Not bad at all! I might just upgrade to the Tab S3 8.0, even though I prefer the Tab S 8.4 form factor which was a significant reason I passed on the Tab S2. I wouldn't mind a performance upgrade but I'll be sticking with my 8.4. The screen ratio is just much more useful for me. My coworker just got a Tab S2. Man those things are thin and light. It's thinner than my Note 5. Pretty cool. iPad Air 2 still beats it! Still using iPad 4 & i'm not planning to upgrade anytime soon. Still works great & since i rarely using it the battery standy time is awesome, i only need to charge the device every 3 weeks / 1 month. I'm not Apple fans but sure iPad was the best for multimedia purposes. Samsung, for once in your life put a proper SoC inside a premium Tablet! SD652's Adreno 510 on a 1536p display is guaranteed a mediocre experience at best. Even an Exynos 7420 isn't enough with bloated tablet-optimised Touchwiz. The reason is pretty simple. The Tab S2 is cheaper (or much cheaper with the 8.0 one) than thr S6, but the cost to produce is much higher. Samsung just want to keep the gross profit in check, so they recude the hardware inside. This is why I will never buy a Samsung tablet, the internals are s**t. Pixel C is the only Android tablet worth owning. Samsung should use a flagship SoC for their tablets. Like the Exynos 8890 or the Snapdragon 820. The iPad Pro would still be more powerful in everything except maybe multicore. Not if it came with the MP16 and clocked at 2.5Ghz, A72. If you are clocking the GPU with 16 cores at 2.5GHz on a 28nm process, you could cook a burrito on it in 30 seconds just by turning the tablet on. The Exynos 7420 GPU is clocked in the 700MHz range on the S6. samsung never do it on tablet. ss and other android oem only use weak, old date, cheap cpu for tablet. final all tablet of android have lag, weak, slow. if want buy tablet, must buy ipad. don't buy any galaxy tab with old date and weak cpu with price sky. Bring back a 8 inch tablet with a 16 x 9 aspect ratio. Need one for media consumption on my lunch breaks. I have a Air 2 for other needs. I was originally going to upgrade from the Air to the Air 3 but after seeing all this nonsense about a flash and 4 speakers, I can't see it being any lighter than the Air. I refuse to upgrade my tablet unless it's for something lighter and more powerful. Maybe the Nexus 9 (2016) will be what I'm looking for. I was waiting for a new Samsung tab but I may aswell get a K1, Z4 or Pixel C at this rate.